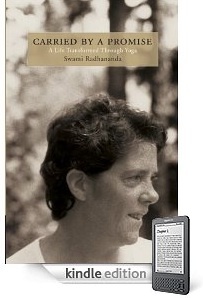 Swami Radhanada’s most recent book, Car­ried by a Promise is now avail­able for the e-book reader, Kindle. Down­load your copy of Car­ried by a Promise and start read­ing right away. Your Kin­dle book can also be read on your computer, iPhone/iPad, Android or Black­Berry device so even if you don’t have a Kin­dle you can still enjoy an e-version of this inspir­ing book. At timeless we believe that beautiful books inspire our learning. In the spirit of the rich tradition of yoga, timeless continues to evolve and challenge the traditional publishing model. As a Canadian micro-publisher we provide an accessible approach to many traditional and new technologies, keeping at heart the desire and the power to transform. We are engaged in green practices that support our natural resources by using post-consumer waste (PCW) paper, vegetable-based inks, print-on-demand and digital distribution. 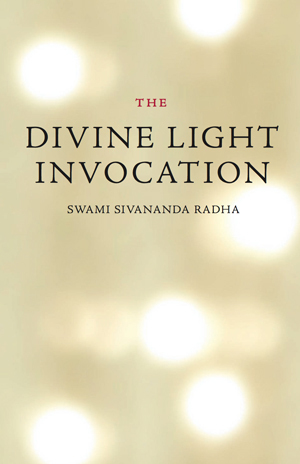 Timeless is committed to publishing the teachings of Swami Sivananda Radha, as well as works by her students and other new and inspiring authors. Featuring articles from her upcoming books! Swami Radhananda has now started posting on her blog. Some excerpts from her upcoming book and satsang videos will be featured on a weekly basis. Keep visiting the site and please offer a donation towards the creation of these inspiring books. Visit her Blog now!